KIEV, Ukraine -- Kiev said Tuesday that Russia had cut off electricity to Ukraine's rebel-run regions in what appears to be another sign that Moscow is losing interest in plans to splinter its neighbour. A man walks through the yard of his home, destroyed from shelling between Ukrainian Forces and pro-Russian separatists in Berdyianske village, in the Donetsk region on July 1, 2015. Russian President Vladimir Putin has gone through an extended spell without peppering his speeches with mentions of a "New Russia" (Novorossiya) made up of Ukrainian lands that were once under tsarist control. The veteran Kremlin leader had fervently promoted the project while the separatists were gaining ground along Ukraine's eastern industrial heartland toward the end of last year. But Ukrainian insurgents who claimed to be in charge of re-creating a part of the old Russian empire have in recent weeks complained of a sudden lack of interest from the Kremlin and a dire shortage of funds. Ukraine's Energy Minister Volodymyr Demchyshyn said Tuesday that energy-rich Russia had recently also stopped supplying electricity to the militia-run regions of Luhansk and Donetsk because bills were not being paid. "We held fairly productive negotiations with the Russians," Interfax-Ukraine quoted Demchyshyn as telling an energy ministry meeting. "We have been able to switch off four lines that ran from Russia to territories outside our control." The energy minister said the cables supplied an allowance of $15 million (14 million euros) of power a month. "That money was not being paid," Demchyshyn said. There was no immediate response to his comments from either Moscow or the rebels themselves. 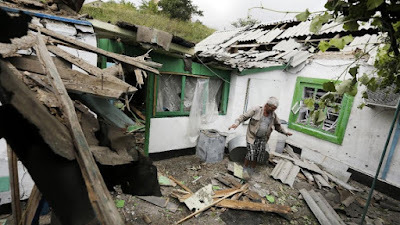 Their 15-month revolt against Kiev's new pro-Western position saw the rebels carve out a region about the size of Wales that is home to 3.5 million people and shares a 500-kilometre (300-mile) border with Russia. But much of the region remains a ghost of its proud image as the economic driving engine of the former Soviet Union's second-largest state. Most of the coalmines and steel mills have been either shuttered or cannot operate because of chronic shortages of electricity. Kiev policy hawks such as Ukrainian Prime Minister Arseniy Yatsenyuk have also pushed through a raft of measures designed to erect a punitive "economic blockade" of rebel-run territory. Yatsenyuk ordered Ukraine's power suppliers to halt all deliveries to the separatists on May 1. Natural gas flows from the rest of Ukraine to the east have also been significantly lowered. Russia had earlier promised to make up for the shortage by building extensions and branches to existing gas pipelines. It remains unclear where those plans stand today. Kiev officials believe the fighters may be smuggling in small supplies of gas through hastily-erected -- and considerably smaller -- pipes that cross parts of the Ukrainian-Russian border under their control. Demchyshyn's comments came ahead of a new round of negotiations Tuesday in the Belarussian capital Minsk aimed at ending a conflict that has claimed more than 6,600 lives. Efforts to stop the fighting seem locked in stalemate. The EU-mediated meeting will see Ukrainian President Petro Poroshenko's personal envoy speak to the Moscow-appointed negotiator in the presence of separatist representatives who are not formally part of the talks.